Idol stars shined on the nation's oldest TV singing contest, "National Singing Contest," Monday, bringing their vocal and dancing skills to a show that ordinary people usually participate in. 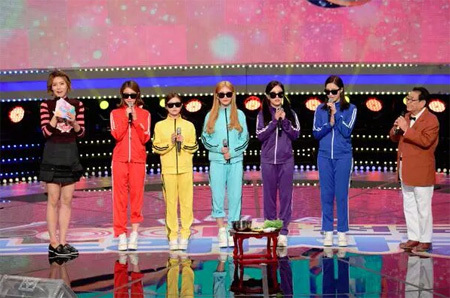 Some 60 idol singers appeared on the KBS show, which was specially planned for the Chuseok holiday season that began on the weekend and continues until Tuesday. Hosted by Song Hae, 88, who has been presenting the program since its debut in 1980, the show had singers in their 20s and 30s perform hit songs from the past. Boy band B1A4 sang and danced to a 1975 number by trot singer Song Dae-kwan. Amber from girl band f(x) performed 1999 techno song "Come On" by Lee Jung-hyun. Girl band A.O.A performed Hyun Jin-young's dance number from 1994, and boy band Homme did trot number "Nest," sung by Nam Jin in 2000. Media reports praised the show for giving viewers a chance to see the idol singers perform past hits instead of their own songs. 아이돌 그룹 멤버들과 국민MC 송해가 함께 꾸민 ‘아이돌 전국 노래자랑’이 한가위 TV프로그램 수작이라는 호평을 끌어냈다. 28일 방송된 KBS 2TV 추석 특집 예능프로그램 ‘아이돌 전국 노래자랑’에는 각 지역을 대표하는 아이돌이 각자 개성을 돋보이게 하는 분장을 하고 예심전에 참가했다. 기상천외한 콘셉트부터 다양한 개인기에 웃음까지, ‘아이돌 전국 노래자랑’은 추석 차례상만큼이나 그 볼거리가 풍성했다고 관련 뉴스들은 전했다. B1A4는 옛날 교복을 입고 ‘해뜰날’을 열창 하면서 강렬한 비트로 분위기를 전환해 아이돌 특유의 칼군무로 무대를 휘어잡았다. 에프엑스 엠버는 긴 머리 가발을 쓰고 이정현의 ‘와’를 불렀고, 비투비 멤버들은 금도끼 은도끼로 분해 몸을 던져 코믹 연기로 좌중을 폭소케 한 후 수준급 가창력을 선보였다. ‘아이돌 전국 노래자랑’은 아이돌 가수들이 익숙한 노래가 아닌 새로운 노래와 공연을 선보여 시청자에게도 다양한 볼거리를 안겼다는 평이다.